NEW YORK (TheStreet) -- December 26 will be the one-year anniversary of my purchase of eBay (EBAY - Get Report) shares. During that time, not much positive has been said about the company. Just a few short weeks ago Ladenburg issued a downgrade, stating that "until eBay can reclaim the $54 level, we believe eBay will be rangebound." Shares then dutifully traded down to the lower end of that range and have since been nestled near the mid-point. The word "rangebound" is absolutely music to my ears, despite the fact that they may scream of mediocrity and lost opportunity to many others. It is as good of an example of the aphorism that "one man's trash is another man's treasure." This has been one of my slowest trading weeks in a long time. Everyone, including myself, was eagerly awaiting the release of the Federal Open Market Committee minutes and Federal Reserve Chairman Bernanke's likely last press conference. Still, I bought shares of eBay. Having done so marked the 15th occasion in about a year. The shares always create an opportunity for me to sell call options, usually utilizing short-term and near-the-money strike levels. During that time, eBay has indeed traded in a range. The $10 range from the yearly high to yearly low would have represented a 21% return for that very special investor who was able to purchase shares at the low and then exercise perfect timing by selling shares at their high. Even then that would have underperformed the S&P 500 for the year. For anyone practicing a buy-and-hold approach to eBay and entering a position at the same time I did, 2013 has been a lost year. Shares almost been unchanged in that time. I'm certainly not the perfect investor who times tops and bottoms precisely. But I keep an open mind. eBay is an example of why the imperfect "trash" underperformers are worth reevaluating on a recurring basis. Also, it's an example of why there may be no particular advantage to overthinking the analyst commentary and issues that everyone else has already considered. I don't think very much about eBay's ability to compete with Amazon (AMZN - Get Report) or about challenges that may be faced by its profitable PayPal division. It's not very likely that I would have any great or undiscovered insights. 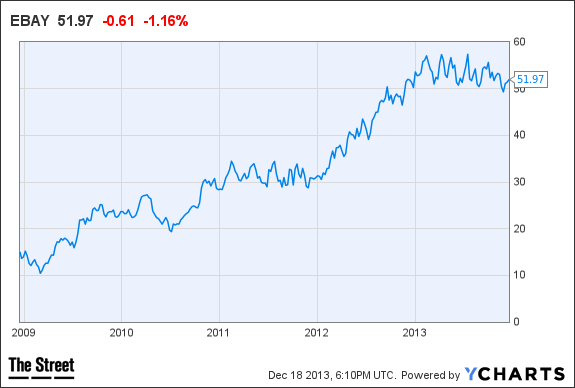 What I care about is the horizontal performance that eBay exhibited for much of 2013. Ladenburg highlighted this and saw it as bad. I disagree. For me, the average cost of the 15 lots of shares was $51.41, while the average strike price utilized was $51.43. Since eBay doesn't offer a dividend, the net results for the past year have been almost exclusively derived from call option premiums. Those have delivered a nearly 34% return, subject to today's sole open lot being assigned. eBay has given up much of the glory of its past as a market leader. But there's still glory to be had by making it a workhorse in a portfolio that utilizes a covered option strategy. At the time of publication the author had a position in EBAY.